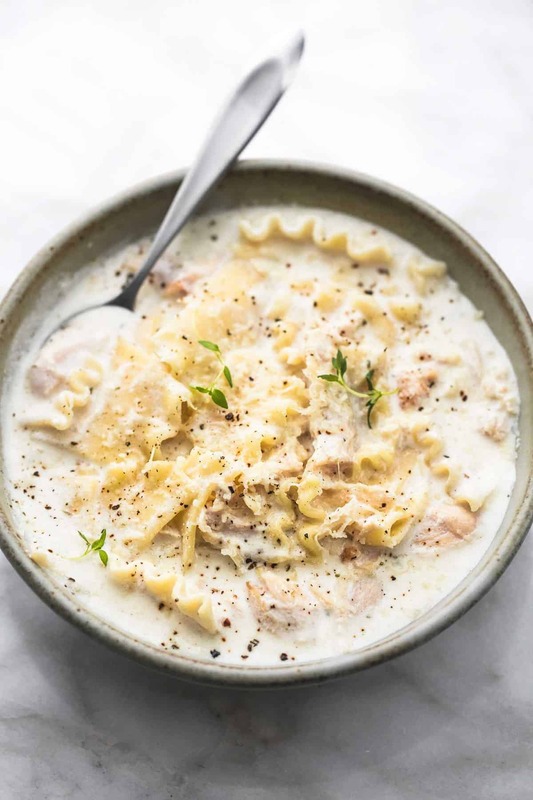 Rich and creamy white chicken lasagna soup comes together in just 30 minutes to make a comforting soup you’ll crave all year long. I absolutely never get sick of soups. Even in the throws of Summer when it’s blazing hot outside I still crave a bowl of soup on a regular basis. This is one of my new favorites and I already know I’ll be making this for the rest of the year. This soup is rich, creamy, and comes together in about 30 minutes. Everything I want in a quick weeknight dinner! 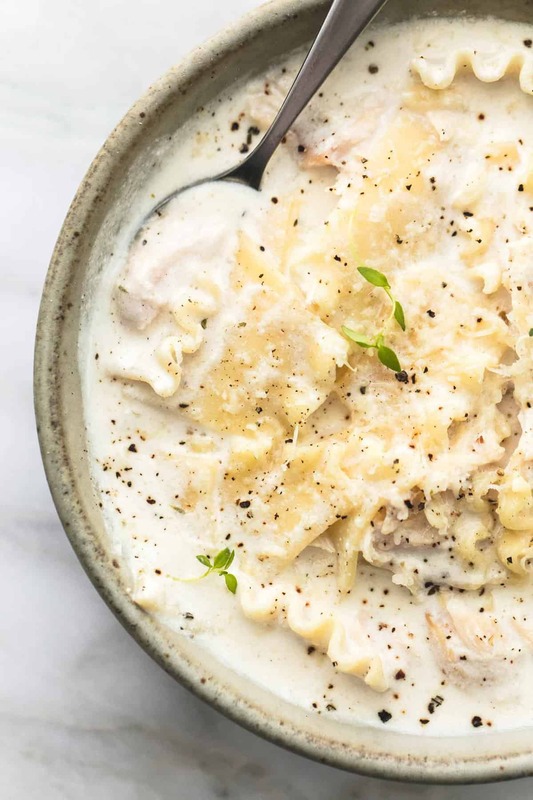 The best part is that it’s a soup version of a pasta dish I just can’t get enough of. I’m rarely a fan of traditional ground beef and red sauce lasagna but white chicken lasagna is right up my alley. This soup is so easy and so delicious I know that you and your family will love it. To make it, start by cooking chicken in a large pot just until cooked through, then transfer it to a plate and cover to keep warm while you make the soup. In the same pot where you cooked the chicken, make a roux by melting butter and stirring in some minced garlic for a minute or so until nice and fragrant. Stir flour into the butter so that it thickens, then gradually whisk in milk and chicken broth. Add seasonings and shredded parmesan cheese and cream cheese and stir until cheese is melted and incorporated into the soup. Give it a taste, add salt and pepper if needed, and add cooked lasagna noodles and the cooked chicken. 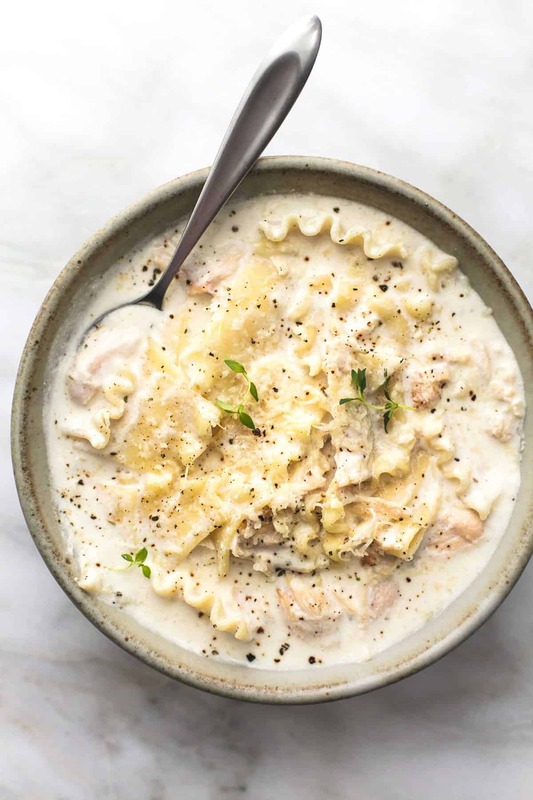 Serve soup immediately and top it off with cracked black pepper and additional parmesan cheese. Annnnnd that’s it! 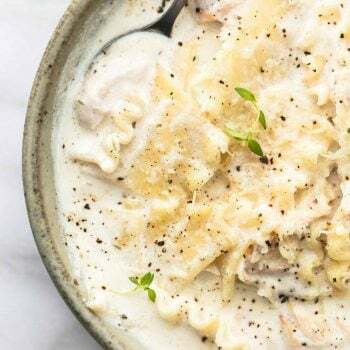 Just a few steps and a handful of ingredients is all you need to get this perfectly creamy white chicken lasagna soup on the table. Even the kids will beg for seconds! 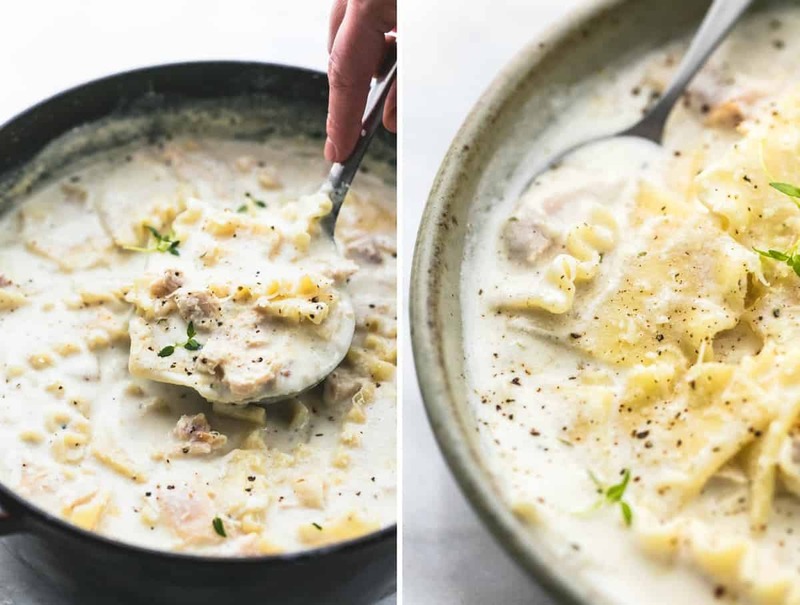 Rich and creamy white chicken lasagna soup comes together in just 30 minutes to make a comforting soup you'll crave all year long. Add oil to a large pot over medium high heat. Add chicken and cook for 5-6 minutes, stirring throughout until cooked through. Transfer to a dish, cover, and set aside. Add butter to pot and stir until melted. Stir in minced garlic and saute until fragrant, about 1 minute. Sprinkle flour over butter and garlic and stir until thickened. Gradually whisk in half and half and chicken broth. Stir in salt, pepper, garlic powder, and onion powder. Bring to a boil and cook for about 10 minutes. Stir in parmesan cheese and cream cheese until melted and incorporated. Stir in lasagna noodles and chicken. Taste and add more salt and pepper if needed. Garnish with chopped thyme or parsley and parmesan cheese if desired and serve. For the Italian seasoning blend, you can substitute about 1/2 teaspoon each dried basil, dried parlsey, dried thyme, and dried oregano. For a thicker, richer and creamier soup, substitute one cup of half and half for one cup of heavy cream. You'll love these soups too! hey girl- this soup looks so yummy! I tried this last night, and it was delicious! The kids really liked it as well- a nice and comforting soup. One thing that I found is that the lasagna noodles, even though they were broken up smaller, seemed too much for a typical spoon to handle. It was almost like you needed a fork. I think I might try penne next time for easier eating. Other than that, it was SO amazing. I made this soup last week. OMG this is sooooo good. My family moans and groans when i make soups or stews for dinner. This however, was a major hit. It is a super rich soup that fills your belly with just a half of a serving. Next time I make it, which will be tonight, I will use milk INStead of half and HALF to cut down on the richness. I will also use either elbow Or penne PASTA due to the lasagna noodles being so awkward in a BOWL. This recipe is a keeper. 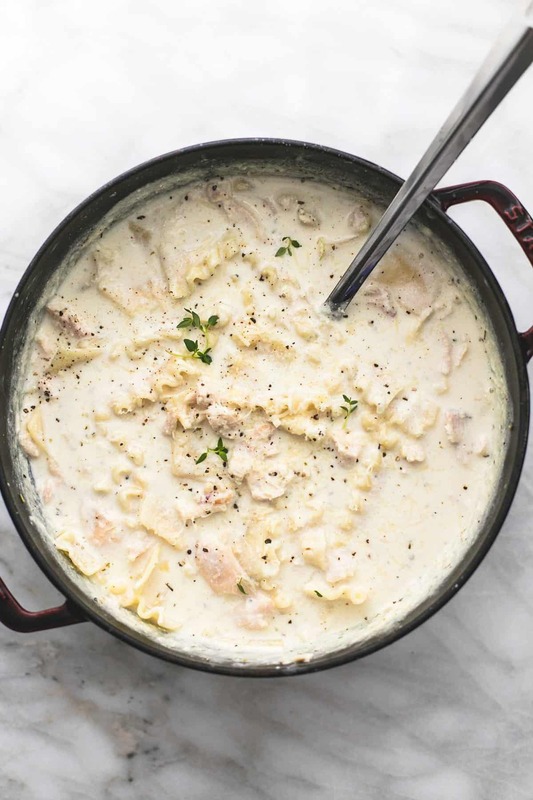 It’s for sure one of our most favorite soups around here as well! Happy to hear it was enjoyed by all! Could you add diced onion and sliced mushrooms to the soup? The pictures look wonderful. Have you ever cooked this in a Crock-Pot before? How would you adjust the recipe to use a CrocK-Pot? Thanks! You totally could add onion and mushrooms- I’m a huge fan of both and would try it! I haven’t done this in the slow cooker, at least not yet! Sorry I don’t have much input for that right now. But if you attempt it, I’d love to hear how it turns out! This was extremely good! My boyfriend and dad loved it and kept talking about how amazing it was. Way to impress the men in your life, Sierra! 😉 Thanks for your feedback! Hey! I am super excited to try this recipe for my family! I have a tot with a gluten and cow dairy food allergy. I will be substituTing Plain, unsweetened Almond Milk, toasted gluten free baking flour (as a thickening agent), He does well with goat lactose So I may make his wIth a creamy goat cheese. His also will be served over rice and not with the pasta. So excited to try this for my fam. Thank you! This was great! I used 1%milk instead of half and half (just what I had) and omitted the creme cheese and it was plenty rich! I also added some vegetables (corn and sweet potato) because that’s just what I do lol! GREAT idea with adding the veggies! I bet that was delicious!! Thanks for your input, Jessica!